The Somerset and Dorset branch to Cheddar left the Glastonbury to Highbridge line at Shapwick going to Wedmore and several villages before getting to Cheddar. The line was upgraded from a light railway when the quarries decided to send stone out through this route. 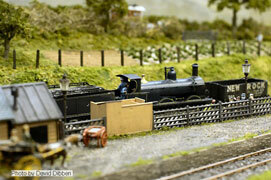 Passenger facilities were not upgraded as the GWR Cheddar Valley line seemed to take most of the tourist traffic. 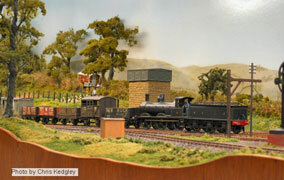 The layout is a could have been as the S & D proposed a line to Cheddar and is set in the 1920s. The scenic section is nominally 8' x 2' plus two cassette fiddle yards making up the rest of the 18.5 square feet. The track plan is a mirror image of a layout in Ian Rice's Wild Swan publication Layouts for Small Spaces.